Solving the mystery of CCC Art and its origins sometimes happens when you least expect it. It is an exciting research day when one of the mysteries surrounding CCC Art can be solved, especially if you weren’t looking for it. A component of the first federal government sponsored fine art programs, the Public Works of Art Project (PWAP) included depictions of the government work programs, the most popular being the Civilian Conservation Corps (CCC). Artists, who were considered roving artists, were briefly sent into camps to make a pictorial record of the life and work. Leland Roger Gustavson (1899-1966) was one of these roving and prolific PWAP artists. Gustavson was sent to several CCC camps during the harsh winter months of January and February 1934. 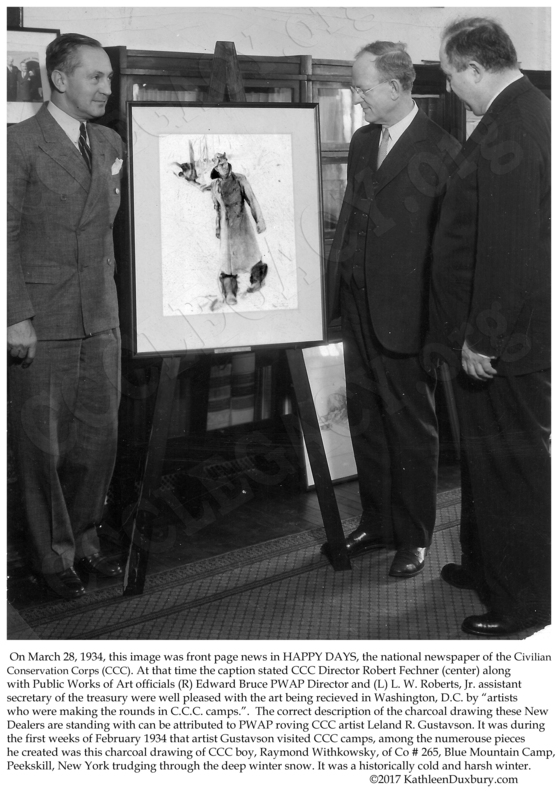 In its March 24, 1934 edition, HAPPY DAYS the unofficial national newspaper of the CCC included a front page report and photograph on the PWAP CCC art projects. Until recently the identity of the CCC boy and the camps where Gustavson’s CCC art was created was long ago lost to history.